The RESERVE® WOOD collection CUSTOM series features custom handcrafted garage doors with window, design, and wood options as unique as your imagination. To get started designing your custom wooden garage doors today, visit the “Where to Buy” section of our website to find your local Clopay® dealer today. Insulated with polystyrene for increased energy efficiency. Premium-grade hardware, rollers and track assure smooth, quiet, long-lasting operation. Learn more about RESERVE® WOOD collection CUSTOM series construction. Unlimited custom garage door designs. Factory finished doors available in seven popular stains or painted. Learn more about RESERVE® WOOD collection CUSTOM series design. - Unlimited custom designs, unlimited wood species and a wide variety of stain and finish options create a one-of-a-kind door. Custom stain and paint colors also available. - Create custom window designs and choose from a wide variety of specialty glass options. 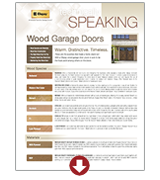 - Specialty woods, such as Ipe or Sapele Mahogany, can also be used to build your dream door. - Doors can be built to have a convenient upward-acting operation or an authentic swing-out operation. Handcrafted 4 or 5-layer polystyrene insulated wood doors. R-value 5.9.